Image courtesy of Library of Congress Elected in 1890, Representative John Langston of Virginia boasted a political career dating back to the antebellum period. On this date, African-American Representative John Langston of Virginia died in his Washington, D.C., home. Born free in Virginia, Langston was raised by his older brother in Cincinnati, Ohio. Having earned a master’s degree in divinity from Oberlin College in 1852 and gaining admission to the Ohio bar in 1854, Langston embarked on a long and prestigious political career. He was one of the first black men in America to hold elective office when he won the position of Brownhelm (Ohio) Township clerk in 1855. Following the Civil War, Langston worked as an inspector for the Freedmen’s Bureau, founded Howard University Law School in Washington, D.C., and served as a diplomat to Haiti and Santo Domingo. 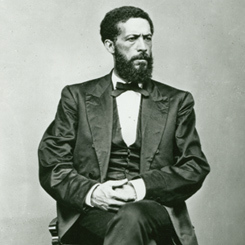 After Langston settled near his birthplace in south-central Virginia, a local citizen’s committee convinced him to run for a U.S. House seat in 1888. Langston won a hard-fought GOP nomination, but lost the general election to the 51st Congress (1889–1891) by 641 votes to Democratic candidate Edward Venable. Intimidation and fraud marred the polling and Langston contested the election. Though Democrats abandoned the chamber to prevent a quorum necessary for the House to seat him, Langston eventually was admitted as a Member. Langston spent his short congressional career defending the dwindling rights of African Americans in the South. “Abuse us as you will, gentlemen,” he declared on the House Floor. “There is no way to get rid of us. This is our native country.” Langston narrowly lost re-election to the 52nd Congress (1891–1893), and thereafter refused to run again. He spent the remainder of his life living among Washington’s prestigious black elite.